Stems: Erect, branching, glabrous; branches slender, upright or spreading; bark of young trees red with yellowish leaf scars; bark of mature trees brown, furrowed or ridged. Leaves: Alternate, simple, sessile; base narrow, brown; lanceolate to ovate-lanceolate, 1/16 to 1/8 inch long, scale-like, overlapping; blade thick, gray-green; margins entire; tip sharp-pointed; surface with salt-excreting glands. Inflorescences: Raceme, spike-like, 3/5 to 3 inches long, 1/8 to 1/6 inch wide; flowers many; bracts triangular-trowel shaped; margins more or less minutely-toothed; tips pointed. Flowers: Sepals 5, not united at base, narrowly trowel-shaped, to 1/25 inch long, green; margins irregularly-toothed; petals 5, alternating with sepals, egg-shaped, 1/25 to 1/15 inch long, pink to white or reddish-lavender; stamens as many or more than petals; filaments inserted under disk near margin. Fruits: Capsule, cone-shaped, 1/8 to 1/6 inch long, narrowed into beak; seeds many, minute, tuft of hairs at tip. Habitat: Stream banks, lake edges, river flood plains, salt marshes, roadsides, disturbed areas; sandy soils; will tolerate saline and alkaline soils. Origin: Introduced into the United States from Europe in the early 1800's and now naturalized. Was used as an ornamental and escaped. Was also introduced by the USDA between 1860 and 1915 for erosion control and was planted in windbreaks. Reproduction: Seeds spread by wind and water. Forage Value: Little forage value. Uses: Provides shore stabilization. Game birds, song birds, morning doves, and mammals use it for cover. Rabbits eat the bark of young trees during the winter. 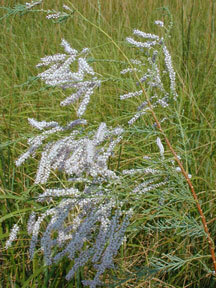 Comments: Salt cedar is aggressive and will invade areas, crowding out native plants. It is deep rooted and consumes large amounts of water, lowering the water table along streams. The common name "salt cedar" refers to the tree's ability to tolerate salt and it's cedar-like appearance.